Ross and Clementine Savasi welcome you to KBC. Our operation is located in the Township of Douro-Dummer, Ontario, about 30 Km east of Peterborough, just south of the village of Warsaw. We raise Border Cheviot sheep from purebred registered stock. Our animals are raised on forages grown organically on our farm with the addition of a balanced cereal-based ration offered by the local farmers’ co-operative a month prior to breeding, at the stage of late gestation and for about a month after lambing. 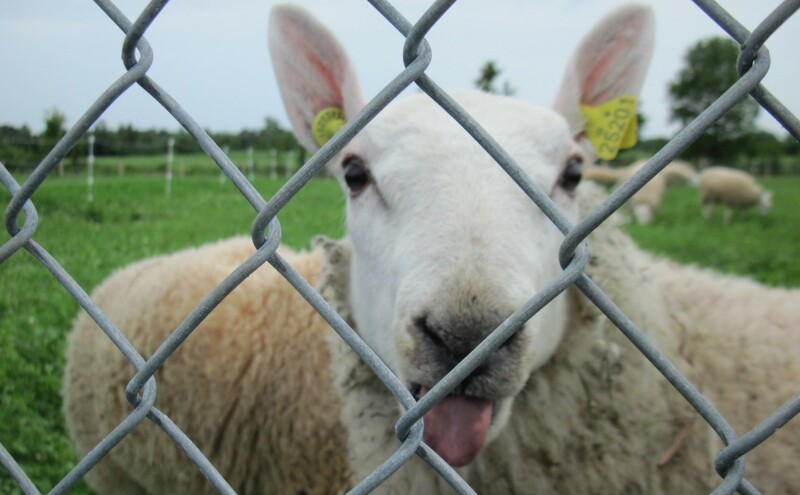 All our animals have been selected for resistance to the ovine form of Spongyform Encephalopathy (commonly known as “scrapie”) and are regularly vaccinated against all the common ovine diseases. We have been running our flock as a “closed flock” for the past five years and do not attend shows or animal fairs to avoid the associated risk of importing diseases. We breed Border Cheviots because they are hardy and smaller framed and boned than other breeds. They are thrifty, excellent forage converters, have a fairly long breeding season, great mothering instinct and produce lambs that are vigorous and finish well on good pasture around six month of age at an ideal 25 to 40 Kg of live weight. The Border Cheviot, also known as the South Country Cheviot to distinguish it from its larger framed cousin, the North Country Cheviot, is a maternal breed of domesticated sheep from the UK. It is native to the Cheviot Hills located at the border between England and Scotland. It was already recognized as a breed more than six centuries ago and it has always been prized for its wool and mild tasting meat. Cheviots are easily recognizable because of their wool-free white face and legs, pricked ears, black nostrils and feet and, last but not least, because of their natural elegance. They were the preferred breed of the Queen Mother, who used to keep a small flock on the grounds at Balmoral castle. Having survived in a semi-wild state for centuries in a relatively harsh environment, they are very alert, active and independent. The process of natural selection has ensured that they have become hardy (they are known to give birth in the wild in snow banks) and thrifty (they survive at times foraging on heather). The ewes are excellent mothers, rarely requiring assistance when giving birth and quite capable to produce all the milk necessary to raise their young. A prolificacy rate of 150% is commonly achievable for animals in good health and supplied with the level of nutrition needed. Their lambs are usually on their legs and nursing within a half hour after birth. We began raising Border Cheviots in 2011 by assembling a small flock of 30 purebred and registered ewes and 2 rams that we acquired from three reputable Quebec breeders. The decision to reintroduce animals on our farm, after a hiatus of more than ten years, was based on our belief that, in order to protect the productivity of the soil, it is imperative to recycle as many of the nutrients extracted by the crops by using the crops to feed animals and have them return such nutrients to the soil through the deposition of their manures. We settled on the Border Cheviot as our choice of breed because of their hardiness in our climate, which makes them a forgiving animal to raise for a novice shepherd, and because of their reputation as very efficient converters of forages into mild tasting meat. We joined immediately the genetic evaluation program offered by the University of Guelph known as GenOvis and benefited in doing so by the fact that the Quebec breeders of the animals were members of the same program and therefore a very valuable amount of historical data was already available on such animals. In 2012 we imported two additional quality rams from a very reputable US breeder of purebred registered Border Cheviots (Misty Acres of Pennsylvania). That importation made it possible to base our breeding program on four rams belonging to three blood lines. We are eagerly looking forward to the spring of 2016 to evaluate the results of the fifth breeding of our flock, based on the careful selection of the best pairings of the genetic traits of our animals and the continuous selection over the past years of the highest scoring animals as future breeders to be retained in the flock. At this point in time all our breeding animals are tested to be “scrapie resistant”. This puts us in the enviable position of being able to guarantee to any buyer of our breeding stock that they are acquiring animals with the strongest possible resistance, from a genetic point of view, against the scrapie disease. A further interesting aspect of our selection program of the animals retained as breeding stock is that we have been striving all along to produce Border Cheviots that score the highest possible combined maternal and terminal indexes. We have noticed over the past few years that we have succeeded in producing a progressively increasing number of lambs exhibiting such characteristic and we were very pleased to have our thinking confirmed by one of the best breeders of Dorset sheep in Ontario, whose mentorship program we attended in 2014/15. Because of our stringent selection program, KBC is still a small operation. We are still working with a flock of 30 breeding ewes. However, the quality of our animals has now reached a remarkable level and we feel comfortable in offering a small number of breeding animals for sale after our spring 2016 lambing season. Such animals should be of interest to producers who wish to bring high levels of Border Cheviot genetics in their flocks and to enthusiasts of this breed who may wish to start their own purebred and registered flock. We have selected a few ram lambs born in May 2016 to be offered for sale. They are all pure-bred and sired by rams belonging to three different blood-lines. They are all resistant to the scrapie disease (AA-RR), they have been vaccinated with the eight-in-one vaccine (Tasvax 8) and can be registered if required with the Canadian Livestock Registry Corporation (CLRC).